If your job or daily task requires you to print stickers, address labels, bar codes, custom labels or even mailing seals frequently, the creative mini printer for stickers, Brother QL-570 by Brother Solution Centre might be a good solution for you. The sticker printer, QL-570 is cute and small in size. It weighs only 2.5 pounds and the dimension is 5.2″(W) x 8.2″(D) x 5.6″(H). However, the printing quality for this small feature is excellent. You can bring the printer along anywhere and print out a wide variety of peel-and-stick labels with your own texts and graphics on the spot as and when you need it. 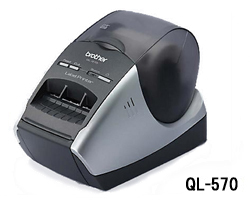 The Brother QL-570 uses thermal printing method. The print speed can achieve 4.3” (110mm) per second. The printing resolution is about 300 dpi/720 dots, good enough for you to print high resolution logos or photos on your customized stickers. The sticker loaded into the printer is in rolls. As a result, users can switch to the format they need. The maximum print width is up to 2.3” (59mm). The labels can be pre-cut standard sizes or custom length. The mini stickers printer is compatible with Windows 2000, XP, Vista and Mac. It can be hooked up to a PC with a USB cable.